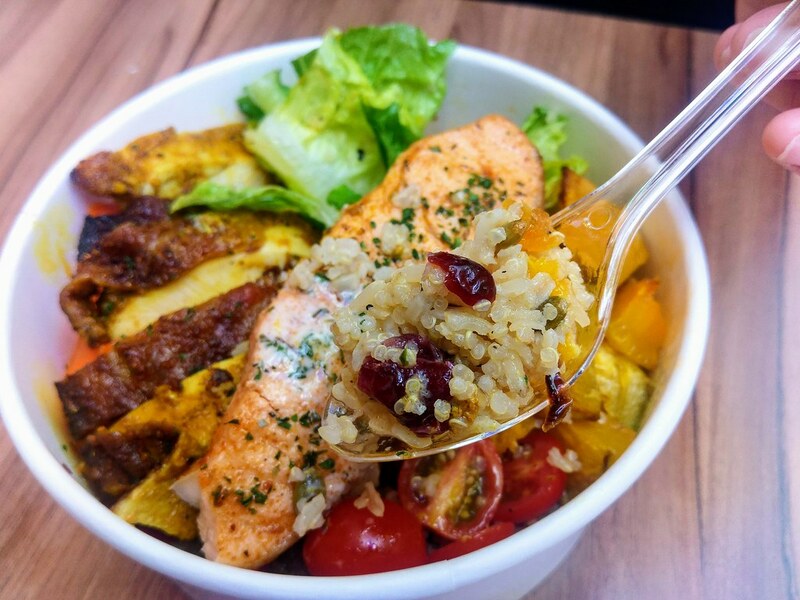 Nature’s Nutrition has recently opened their second food service outlet at Far East Square serving quinoa bowls and housemade kombucha. 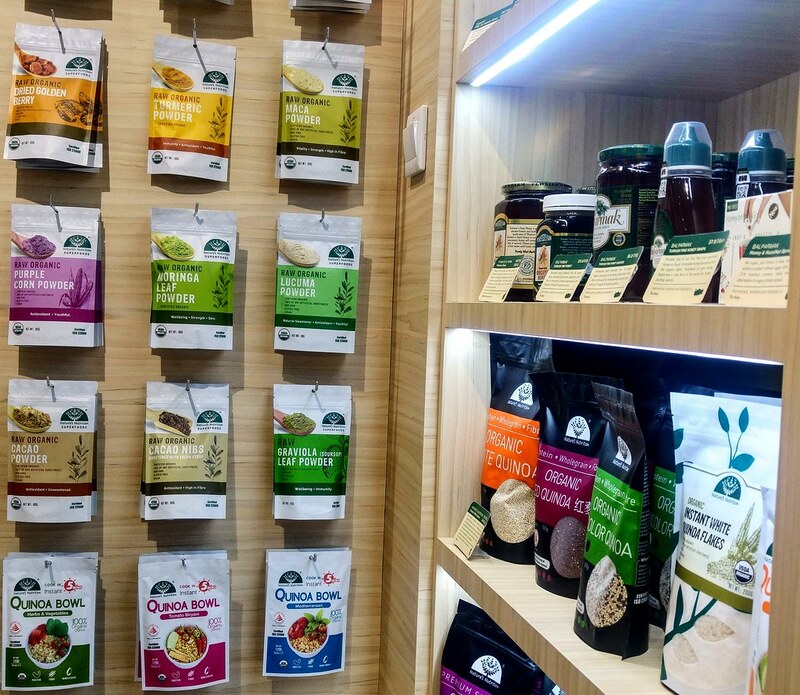 If you are into superfood, Nature's Nutrition may be a brand that you are familiar with - A flagship brand by Nature 2000 Pte Ltd, a Singapore grown food distribution business specialising in organic superfoods and healthy packaged food, you will find their presence in major supermarkets, department stores, online platforms and organic shops. Instead of letting the packaged food stay cold on the shelf, they hope to connect with you by allowing you to experience the packaged food the company distributes. 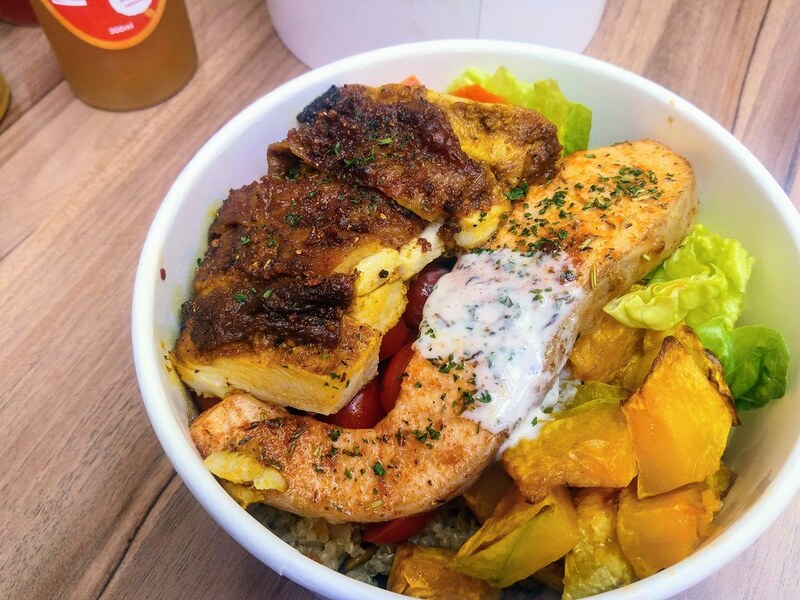 Focusing on organic quinoa which they distribute, there are 4 types of Quinoa Bowls to choose from - Cajun Chicken ($8.90), Spicy Roasted Chicken Tikka ($9.40), Portobello Mushroom with Cheese ($9.40 ) and Baked Salmon Quinoa Bowl ($10.90), along with one base, 2 fixed toppings and 2 variable toppings. Add-ons options are available as well. Instead of having to add on dried fruits and nuts mixture, their specialty base is already wholesome with organic quinoa, dried fruits, chia seeds, brown rice and pumpkin seeds. The fixed toppings are roasted pumpkin, which are really yummy, and romaine lettuce. 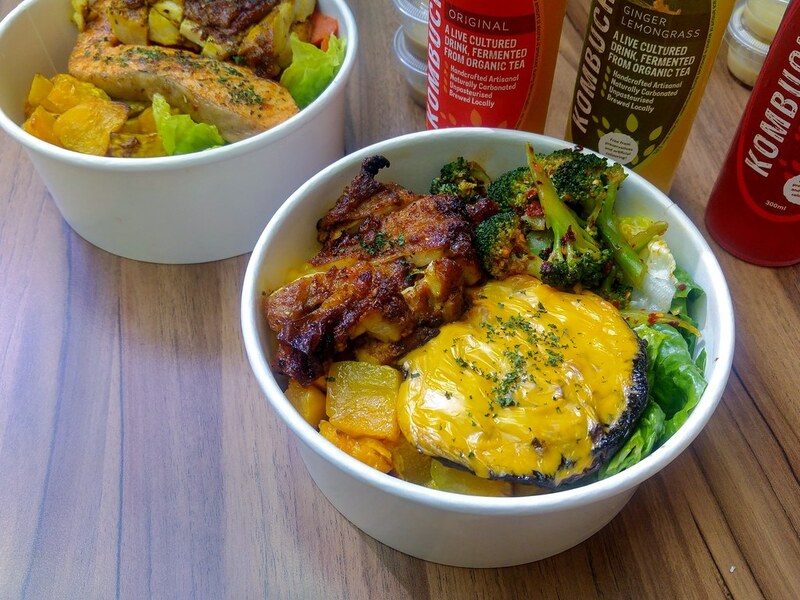 Our Spicy Roasted Chicken Tikka Bowl came with add on Portobello Mushroom with Cheese (+$3.00). Together with 2 variable toppings - miso butter corn and spicy broccoli, it was one big hefty bowl! The Chicken Tikka is popular for a reason - tender, juicy and moist, it was kind of unexpected coming from such concept. I would recommend pairing it with the yogurt dressing. The portobello mushroom was grilled to the right doneness. Nothing really could fail with melty cheese I guess. I didn't like the spicy broccoli at all, which soaked my grains with chilli oil. 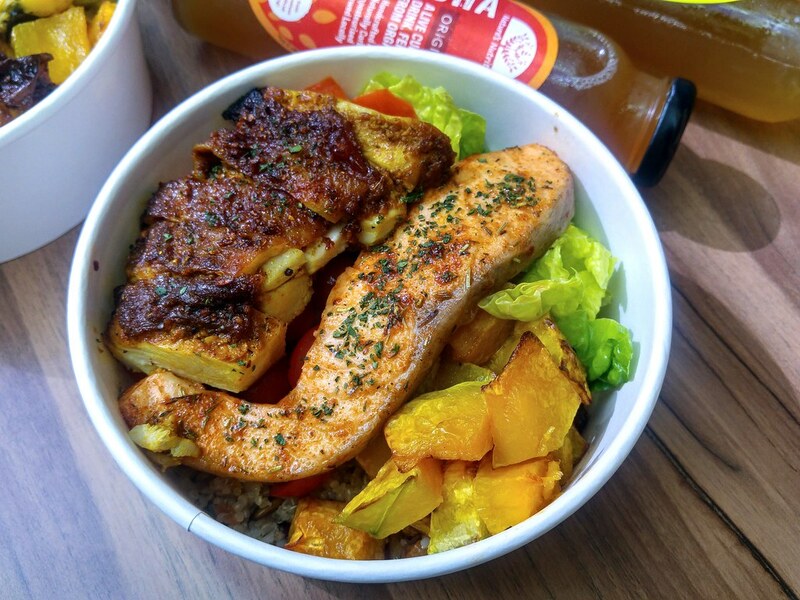 We had the Baked Salmon Quinoa Bowl as well, along with marinated cherry tomatoes and soft chunks of honey glazed carrots. The salmon was quite moist and tender too. But what I really appreciate is that all toppings have been treated one way or another and not served cold, which makes any bowl warm and hearty. 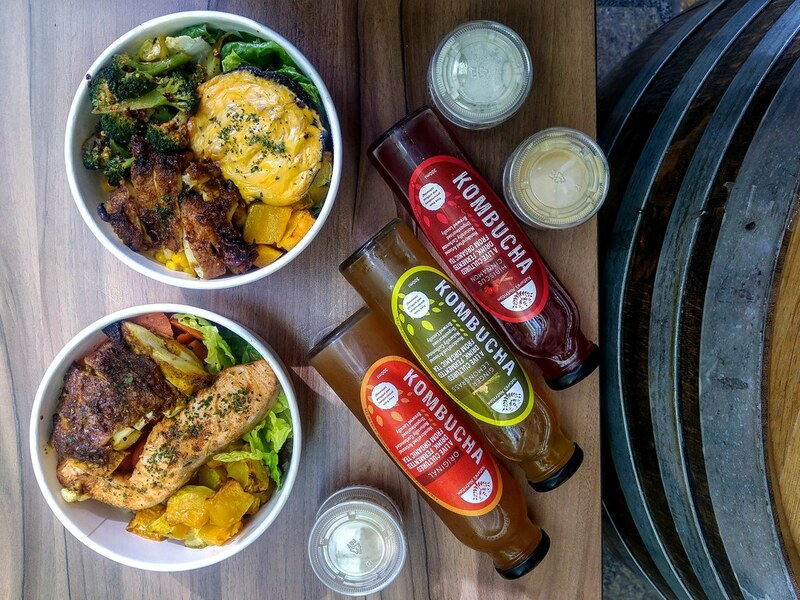 And with just $3 more, you can enjoy a bottle of their house-brewed Kombucha made from their own organic tea series - Original Kombucha ($4.90 ala carte/$3 with bowl), Hibiscus Cinnamon Kombucha and Lemongrass & Ginger Kombucha. This pricing is by far one of the more affordable ones around. While all are equally refreshing, my personal favourite is the Lemongrass and Ginger. Other than homemade, rarely I get to enjoy a lemongrass drink without the presence of sugar. 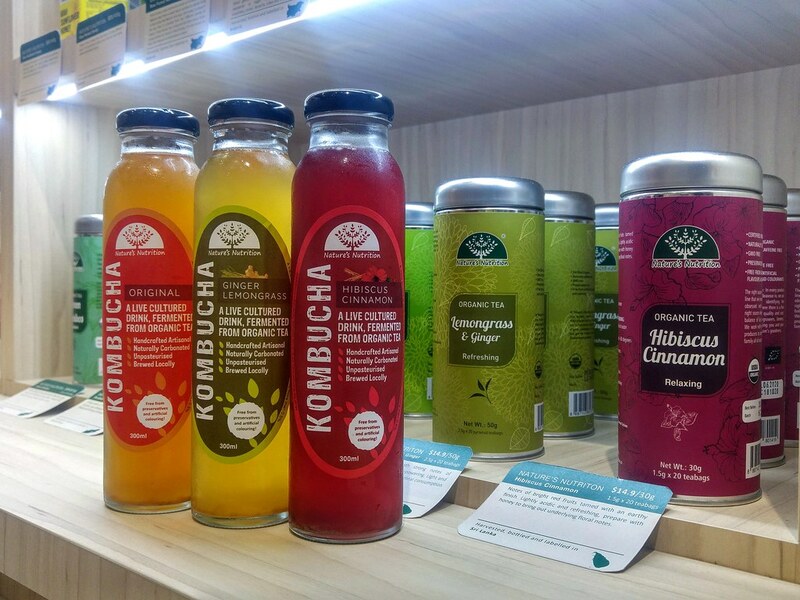 After experiencing their quinoa bowls and kombucha made from their own packaged organic quinoa and organic tea series, and you are intrigued by them, they are available right on the spot for purchase!